THE DOWN UNDER CENTRE ARE STARTING 2016 BIG! Date 15.12.2015 Hosting our major event, ‘Moving Down Under’ with our expert partners, meet us all and get everything you need to start or help your migration journey to Australia. Over the day you’ll have the opportunity to have a one to one migration and employment talk, speak to an international removal specialist, talk skills with the Australian Government Approved Skills Assessing Bodies, talk finance with National Australia Bank (NAB), currency exchange experts Moneycorp and pension transfer specialists, Global Qrops. Also Bupa who’ve have been providing health cover for over 65 years. Not to forget you’ll be able to get loads of lifestyle and travel info from the Australia Work & Travel Guide. It doesn’t matter what stage you’re at with your migration journey, even if you’re right at the beginning, we’re here to help! Consult with a migration agent, hand your CV to a job recruiter, set up your bank account, or get your Skills Assessment! 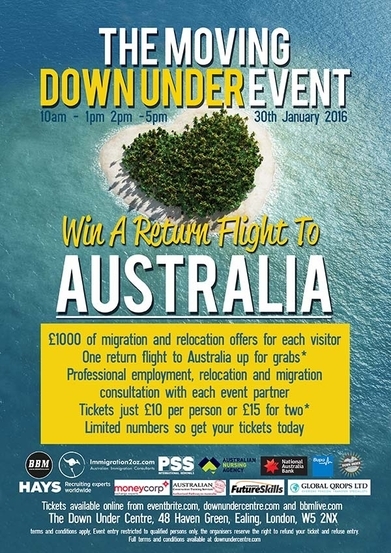 10:00 – 13:00 14:00 – 17:00The best part of all this is that every person who attends this exclusive migration event will be given a Moving Down Under Event goodie bag packed with £1000 worth of relocation and travel goodies and one person from the event is guaranteed to win a return flight to Australia from the UK. As the event is capped at just 80 people you’ve got great odds on the winner being you so why not take a punt on being the first 2016 £10 Pom! Bring your mates, your partner or the kids to join us for a traditional Aussie BBQ, Beers and wine at the height of British winter in the dedicated Down Under Centre! Interested in attending our Seminar? Pick your time and BOOK ON EVENTBRITE NOW!